When Naji Alimam found his seven-year-old fridge full of melting food in August, he hoped his 10-year warranty would provide a quick, wallet-friendly fix. Instead, he began a three month argument with the manufacturer. After CBC Toronto stepped in, Whirlpool offered Alimam a replacement free-of-charge. 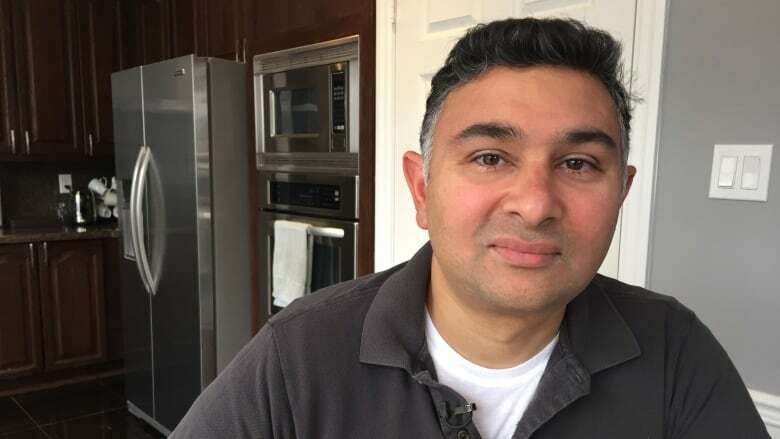 When Naji Alimam found his seven-year-old fridge full of melting food in August, he hoped his 10-year major-parts warranty would provide a quick, wallet-friendly fix. But three months later, Alimam is still waiting. 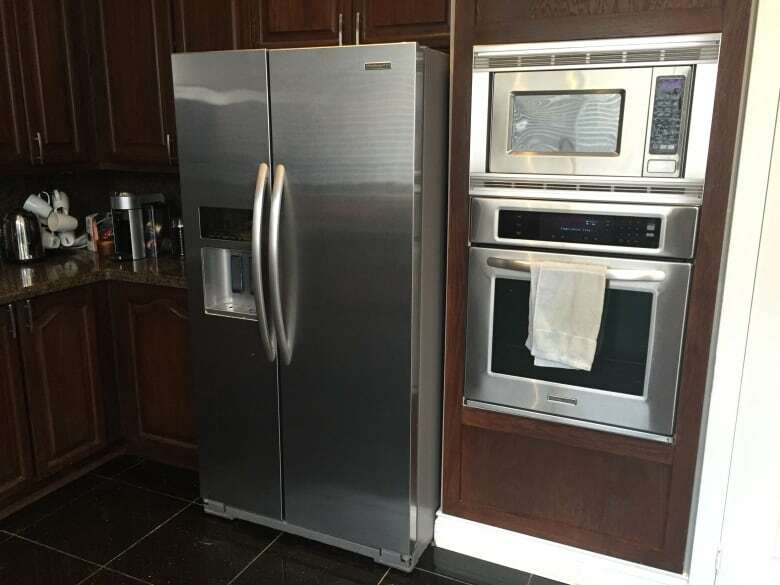 "We do have a second smaller, much smaller fridge," he said. "We are a family of five with teenagers and stuff and it's just a lot of inconvenience." Shortly after Alimam found the problem in August, he called Whirpool, the manufacturer of his KitchenAid product, to send someone to repair it. 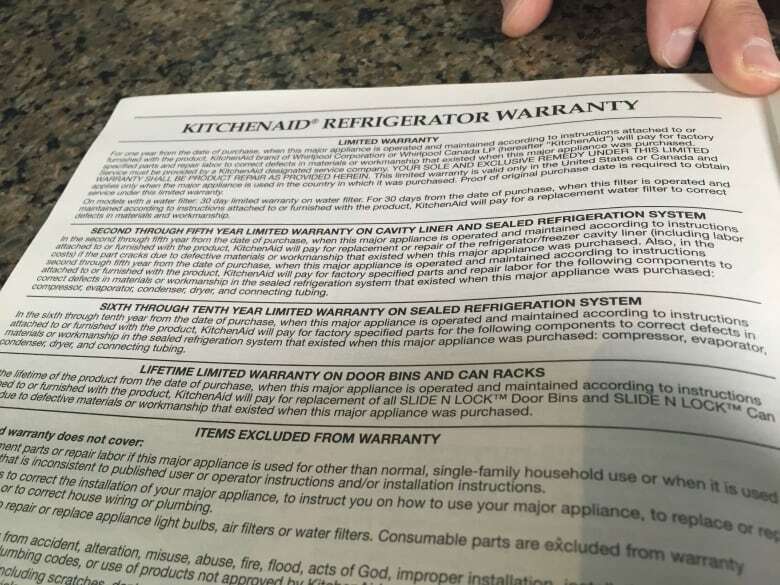 The technician who arrived told him the cooling system tubing was to blame, which is a major part covered under KitchenAid's warranty for up to 10 years. But Whirlpool wouldn't repair or replace his appliance, telling him "it's not repairable," Alimam said. Whirlpool initially offered Alimam a 20 per cent discount on any new refrigerator, or a discounted rate of $2,350 to replace his current fridge. "Why sell me a product and say it has a 10-year warranty on the major components if you're not going to honour the warranty?" Alimam said. "I mean you guys manufactured the product, you should be able to fix it." Alimam spent months going back and forth with the company, finally agreeing to pay $1,400 for a lower-end replacement. "We were sold something that's way more expensive than other products because it has the support and it has the brand," he said. "We don't want to spend thousands of dollars for a new fridge … You feel cornered." In an email to CBC Toronto, Whirlpool wouldn't comment on why the warranty didn't apply in Alimam's case. Instead, the company said it offered him a replacement fridge free-of-charge. In a statement, Whirlpool said: "We regret that this consumer had a difficult experience in resolving an issue with his appliance. We are pleased to have come to a resolution that he is satisfied with." According to owner and operator of Brannan's Appliance Repair Steve Brannan, the resolution reached by Alimam and Whirlpool is one reason why a 10-year warranty may be worth it. "Not everybody is going to get a new fridge," he said. Most new fridges are not built as well as in the past, he added, so there is a chance it could become a write-off when it's damaged. "The warranty of 10 years means that at seven or eight or 10 years if you've got a problem you can say, 'Hey, I paid the extra money, you should do something for me,' and generally they will," he said. Jeff Hoogendam, manager of Tasco Appliances' North York location, also thinks a good warranty is worth the extra cost. "I don't think that products today are built as well as they used to be and you always want to have coverage, so the longer warranty does give you that protection," he said. "I always tell people buy something middle of the line," Brannan said, adding the parts in both are mostly the same, but in "premium" brands, such as KitchenAid, you get a better looking product and a better warranty. If you buy the "value" product with a shorter warranty, Brannan said, you can put that money in your pocket, instead. Hoogendam said it's after the one-year warranty expires many people find themselves in trouble. "Usually, three-to-five years you get a lot of complaints," he said. If you need an extended warranty to get to the five years, Brannan recommends you try to negotiate it into the product price. In anticipation of future problems, Brannan would also tell a potential customer to call the manufacturer to see how long it would take for them to send a technician. If it's too long, he said you may want to consider just paying someone to fix it on your own. Hoogendam also recommends making sure your fridge's warranty covers all the major components. "I think the manufacturer wants a good reputation. They want people to like them," Brannan said. "You're at their mercy, but call them." As in Alimam's case, persistence can yield results. "You say, 'Hey, I bought your product specifically because I was told how good it was, and it hasn't lived up to my expectations,'" Brannan said. "'Do something for me, make an exception.'"